By far the most popular method to deposit and withdraw money (it is available on all online bingo sites). 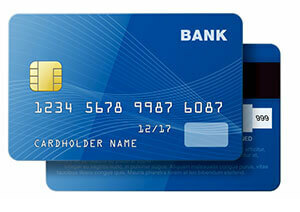 Using your debit card is fast, safe, convenient and you are also guaranteed protection from your own bank. As with debit cards, all online bingo sites accept credit cards (Visa and Mastercard). Many credit cards companies treat purchases on bingo and gambling sites (in other words, making deposits) as a cash advance and therefore charge much higher rates of interest with ho interest free periods of repayment as happens with purchases. Banks that do this are HSBC, Morgan Stanley, Egg, Bank Of Scotland, Lloyds TSB, Halifax, MBNA, NatWest and RBS amongst others, so please check your credit card’s terms and conditions. Aditionally, Mastercard is not available as a withdrawal option. Making a bank transfer to and from your online bingo account is a safe and easy option if you don’t have, or do not wish to use a credit card to make your deposits. As other payment methods come and go, the bank transfer remains extremely popular among online bingo players because it happens to be the most long-standing payment method around. Bank Transfers allow players to have access to their money in a short space of time usually within a matter of days. This is good to avoid the temptation to keep on spending, especially if you haven’t had a particularly fruitful bingo session. If you feel that a few days is too long to wait to deposit funds then this method may not be the best option for you. However, it may be your best bet to withdraw funds if your credit card does not allow funds from gaming sites or if you hit a huge jackpot and bag a few thousand pounds. Make sure you check the fees involved when making a bank transfer from the online bingo site and your bank as these may vary. Most online bingo rooms also offer the option to have a cheque sent to you when withdrawing winnings from your online bingo account. They can be sent in any of the major currencies including Pound (UK), Euro and Dollar (US). It is up to each individual player whether the cheque is posted or couriered to the address you used when you registered your account. In any case make sure to check the fees for getting a cheque mailed as they will depend on your location. The courier service charge will obviously be more expensive than the usual ‘snail mail’ and the amount will be deducted from your winnings, but remember that with the courier service it’s not only faster but it’s almost like paying for insurance that the cheque will not get lost. On a positive note, courier cheques of over £1,000 are normally couriered free of charge in most online bingo sites. Wire transfers are an instant and safe way to deposit money into your online bingo account. Instant Wire Transfers are fairly simple to make a most bingo sites offer them as a payment method. With this payment method players need not divulge any credit card or other personal details. It is quick easy and completely safe.